How was I able to help a patient end 50+ days of a chronic daily headache? What could I see on a simple x-ray that radiologists could not see on a CT scan or an MRI? Why did it take a referral from a family friend to get this patient into a chiropractor? All very interesting questions. Let’s dive in. Most of the details are found in the short video above. But here is a brief summary. Over the next 4 to 6 weeks his headaches became less and and less finally faded away. 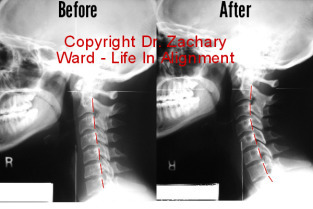 An after image of his neck revealed a change in the position of his first neck bone (atlas) and an improvement in his reverse cervical curve. Thank goodness this young man was smart enough to get a second opinion.